I am so very excited to share that the show that I have been preparing for is also a project that is very dear to me. A few months ago I was invited to curate a show by Susan Schwake of artstream in Dover, NH. Susan only gave me very few parameters to work with- up to four artists working in encaustic and works on the smaller end of the size spectrum. As I wanted the show to be more thematic than about the medium, I decided to focus on a vision of a show that was about time, place, and memory as these are themes that I circle around in my own work. I also saw in my mind’s eye landscapes, seascapes, and dreamy earthiness. The three other artists that will be participating in this show have very different styles, but I felt also speak to those themes. Linda Wein is a painter whose landscapes and waterways captured me in that they speak directly to place, but still are very evocative. 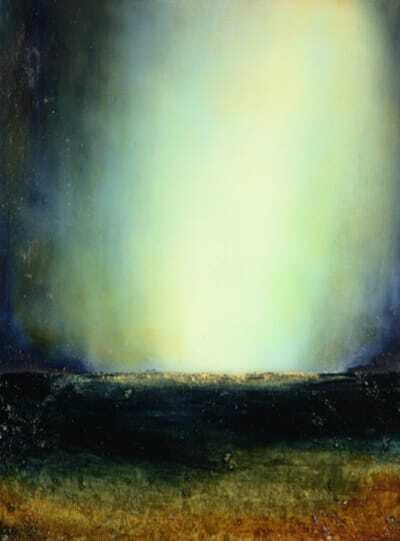 Her paintings also have that glow that pulls me in. Her handling of encaustic really showcases that luminescence that can be created by layers of beeswax and pigment. Kari Hall’s paintings range from pure abstraction to mixed media pieces with references to history, place, time and identity. I feel like her paintings whether abstract or with photo references sit in that in between space. 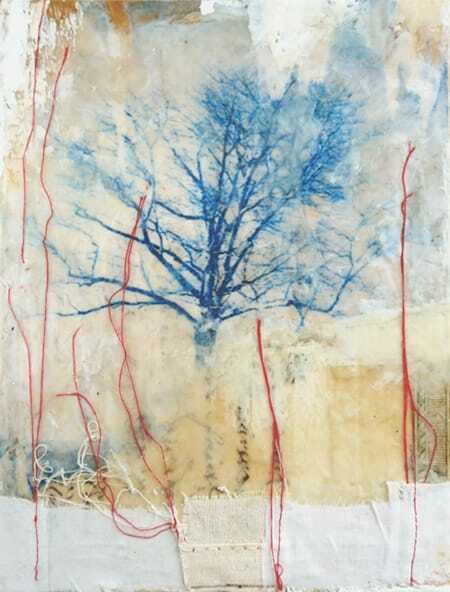 Her layered works of encaustic, paint, and ephemera really invite one to step up close to the surface. 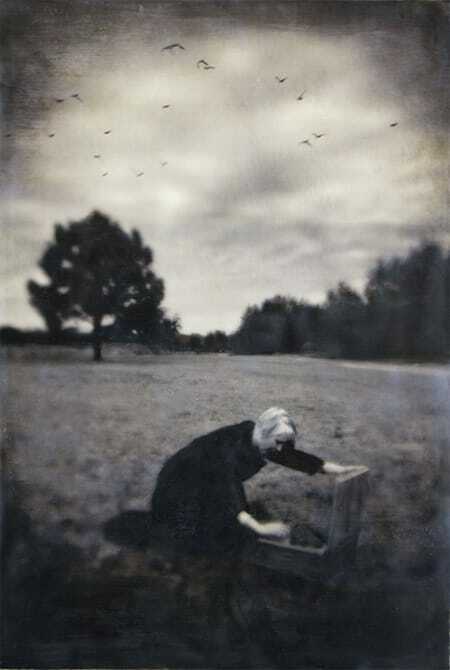 Melissa Hall’s photographs are just so magical to me. She creates images that are firmly placed in the real world, yet seem otherworldly. 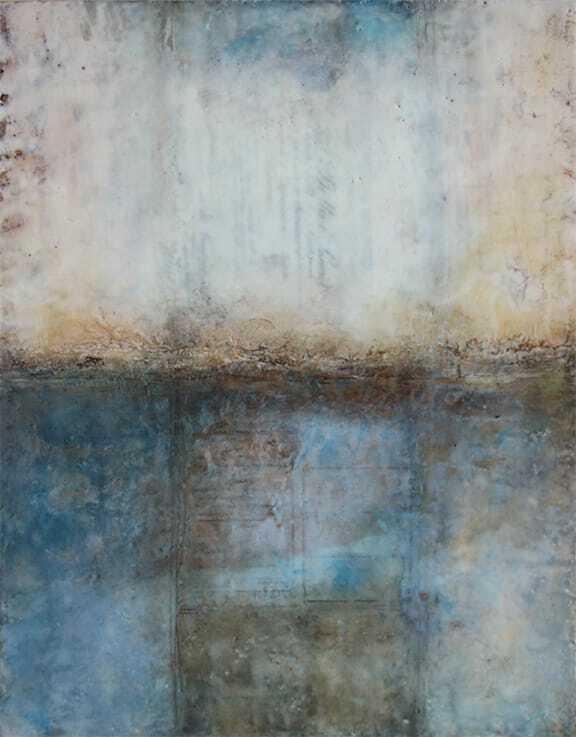 Her work also speaks to place and memory, and the encaustic element adds another layer of depth. For this show I returned back to my mixed media encaustic process and really honing in on creating that sense of in between. I want my mixed media landscapes and imagery to sit in that space between realism and abstraction. I also have been working with a variety of materials and bringing them all together, whether it’s wood, metal, or fabric. I get a lot of joy and satisfaction from that process. The title of the show is Between Here and There. I feel that these works that the four of us will be bringing together speak to the idea of being “Between Here and There” in terms of both place and time. I really am so excited to see it all come together in physical form. Thank you to Kari, Linda, and Melissa for coming along for the ride and a big thank you to Susan for the opportunity! Thanks Jen! I'll be there April 24th for the artist reception. But the show will be up the month of May as well. So far, this has been a fun experience. Wow- every piece you show here is so impressive; it's bound to be an inspirational show! Congratulations! So exciting! Beautiful works, all of them--I'm really glad I'll be able to see more online. Thanks MaryJo. I am very excited and am grateful for the experience. Thanks Mary. I actually have been catching up with my sleep and am terribly behind on everything. ha! I first became aware of her work through that show in Highland Park Art Center as well. Wow. I'm always struck by your use of the tangible, the "identifiable," in an otherwise abstract landscape. However, today I felt compelled to comment because your writing about the show, the other artists, and your intention with your work was equally as beautiful as the artwork itself. Your description really makes me wish I lived closer, just for this show alone! I'll just have to make sure I check in at your blog frequently in April! Thank you Lisa, that is very kind of you, I appreciate it.